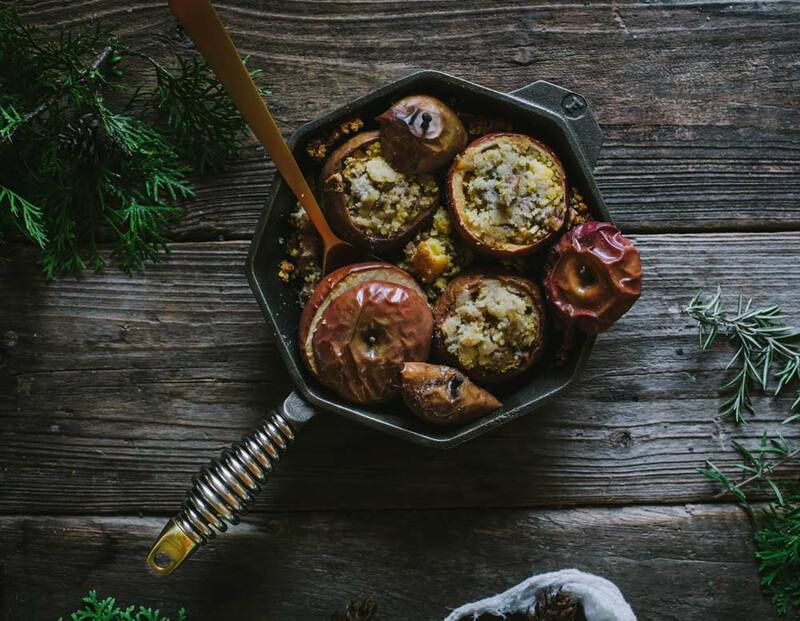 Cornbread Sausage Stuffing Stuffed Apples | FINEX Cast Iron Cookware Co.
We pulled out our FINEX 8″ Cast Iron Skillet for this Cornbread Sausage Stuffing Stuffed Apples recipe by Eva Kosmas Flores of Adventures in Cooking. This dish goes great with the Maple Balsamic Roast Carrots recipe we published previously. Both this recipe and the roasted carrots need to be preheated to 375 degrees Fahrenheit which means you can easily cook them at the same time. 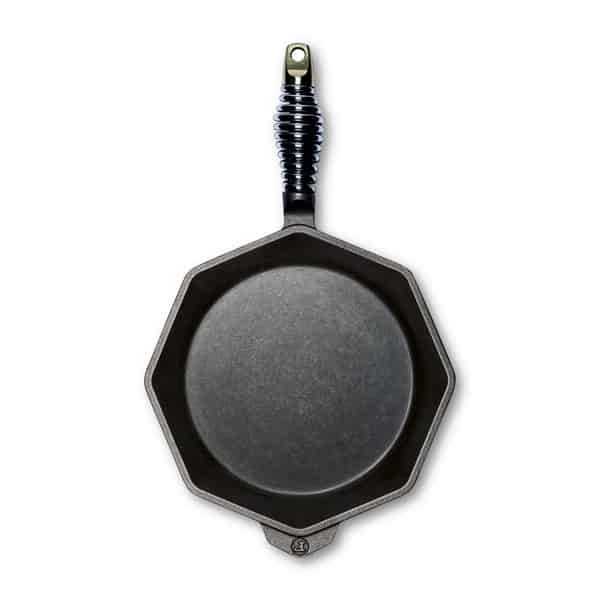 The geometric design of our skillets allows multiple pans to fit into most ovens comfortably. 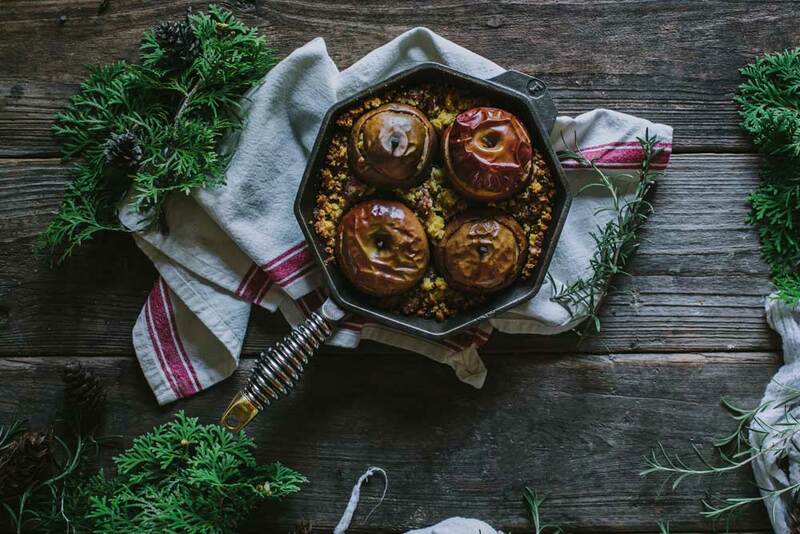 The FINEX 8″ Skillet fits particularly great around other roasting pans and side dishes. Saute the sausage in a medium cast iron skillet until mostly cooked, breaking it apart with the end of your spoon so it cooks into smaller bits. Remove the sausage and set aside, leaving the juices in the cast iron skillet. Add the butter, onion, and celery and sauté until the onions have just started to turn light gold around the edges, stirring every 5 minutes. Remove the skillet from the heat and add the cornbread, rosemary, sage, thyme, and black pepper. Stir until until evenly dispersed, and add the chicken broth, pouring it over the whole mixture. Stir the stuffing one or two times to spread the broth throughout. Empty the mixture into a large bowl and set it aside. Preheat the oven to 375 degrees Fahrenheit. Cut the caps off of the apples, reserving them. Use a melon baller or small ice cream scoop to gently scoop out the core and some of the center of each apple, leaving about 1/4-inch thick wall of apple flesh intact all the way around. 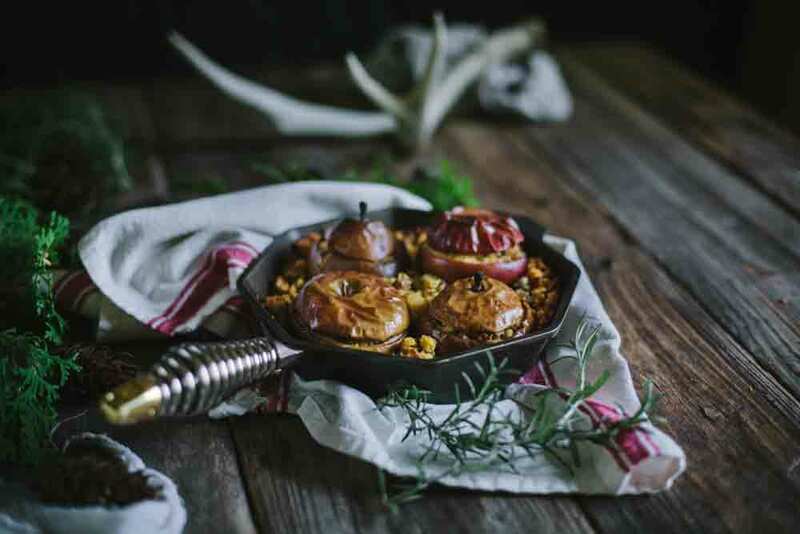 Place the scooped apples in the cast iron skillet and fill each one with the stuffing, taking care not to overstuff so that they don’t burst. Place the caps back on the apples and spoon any remaining stuffing into the cast iron pan around the apples. Place it in the oven and bake for 45 minutes to 1 hour, or until the exposed stuffing is golden brown on top and the apples have softened and wrinkled slightly. Remove from the oven and allow to cool for 10 minutes before serving.